The Word, Gospel, is used in more Senses than one. 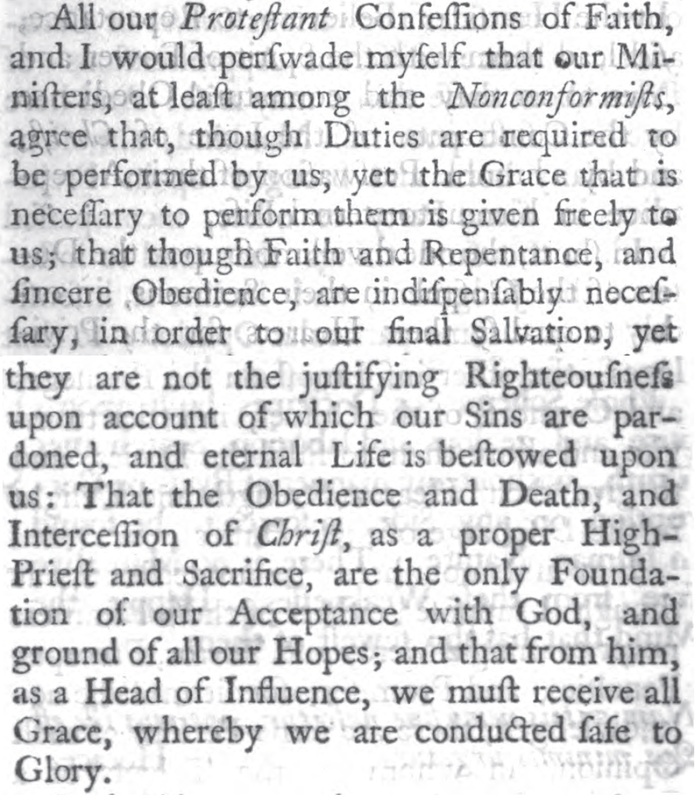 But in the most proper and usual Sense of it in Scripture, it signifies a Discovery of Divine Mercy, through a Mediator, to Mankind fallen into Sin and Misery; Yet it is now peculiarly applied to the Word of his Grace, which reveals Salvation to sinful and miserable Man, and therefore it is often called the Covenant of Grace. This Salvation is made up of many Benefits or Blessings, Part of which are bestowed in this World, and the rest in the World that is to come. The Revelation of these Benefits, and of the Foundation on which they stand, and of the Way whereby we come to be Partakers of them, is the Matter, Sum, and Substance of the Gospel. This Gospel was not revealed all at once in its full Glory to Mankind. There have been several Editions of it, or gradual Discoveries of this Grace in all the former Ages of the World. As soon as ever Adam had sinned, and ruined himself and his Posterity too, by laying the Foundation of their Sin and Misery, it pleased God to publish this Gospel by the Promise of a Saviour, when he told our Mother Eve, that her Seed should bruise the Head of the Serpent that had deceived her, Gen. iii. 15. This, by our Divines, is usually called the first Gospel; for, in the modern Language of the New Testament it signifies, that Jesus Christ should come into this World to destroy the Works of the Devil, I John iii. 8. Doubtless Noah, the second Father of Mankind, had some farther Discoveries made to him, when the Rainbow was appointed as the Seal of a gracious Covenant betwixt God and Man. This Gospel was renewed by Revelations made to Abraham, when the Messiah, the Saviour, was promised to spring out of his Family; in thy Seed shall all Nations of the Earth be blessed. Which Promise is expressly called the Gospel, Gal iii. 8. There was also a Type or Pattern of our Justification by Faith in the Way of the Gospel, when Abraham believed God in his Promises, and it was imputed to him for Righteousness, Rom. v. 3. Moses had a much larger Discovery of the Grace and Mercy of God toward sinful Man made to him, and to the Jews by him, than all the Patriarchs put together: And this was not only done in the Types, and Figures, and Ceremonies, not only in Altars, Sacrifices, Washings, Sprinklings, Purifications, and in their Redemption from Egypt, their miraculous Salvations in the Wilderness, and their safe Conduct to Canaan, the Land of promised Rest; but he had many literal and express Revelations of pardoning and sanctifying Grace, which are scattered up and down in the five Books which he wrote, and which he gave to the Children of Israel to direct their Religion. 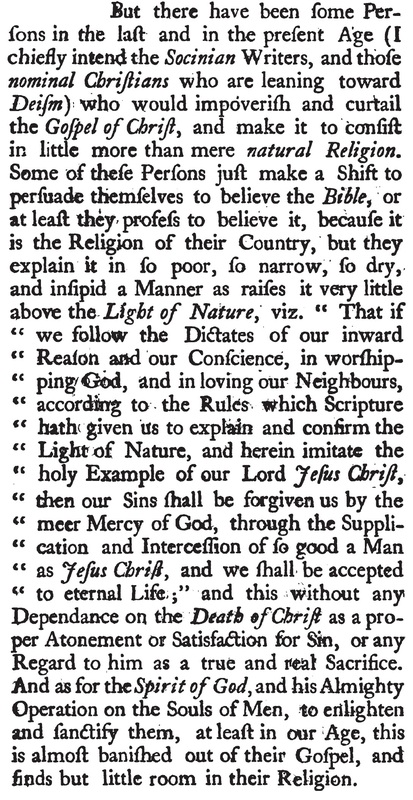 This is also called the Gospel, Heb iv. 2. To them was the Gospel preached as well as unto us, as those words ought to be translated. 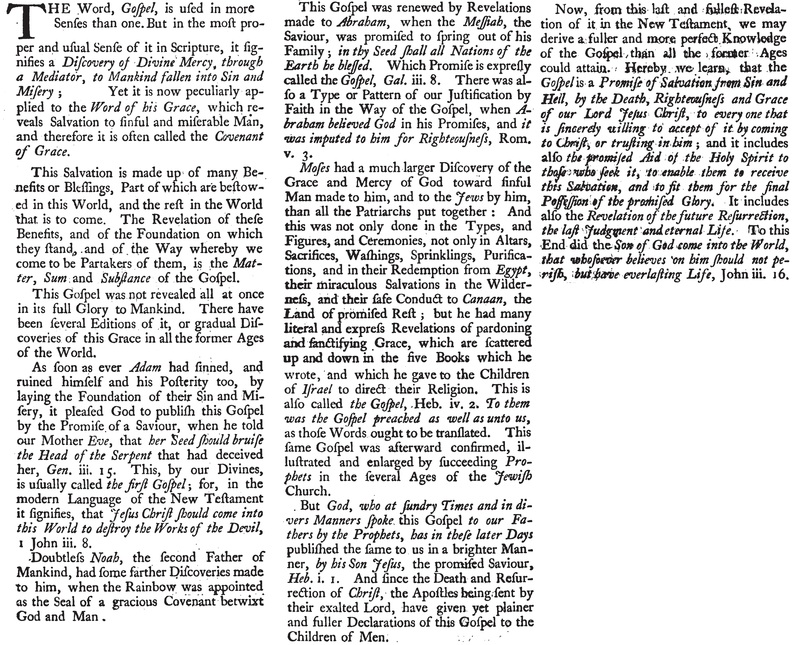 This same Gospel was afterward confirmed, illustrated and enlarged by succeeding Prophets in the several Ages of the Jewish Church. But God, who at sundry Times and in divers Manners spoke this Gospel to our Fathers by the Prophets, has in these later Days published the same to us in a brighter Manner, by his Son Jesus, the promised Saviour, Heb. i. 1. And since the Death and Resurrection of Christ, the Apostles being sent by their exalted Lord, have given yet plainer and fuller Declarations of this Gospel to the Children of Men. Now, from this last and fullest Revelation of it in the New Testament, we may derive a fuller and more perfect Knowledge of the Gospel than all the former Ages could attain. Hereby we learn, that the Gospel is a Promise of Salvation from Sin and Hell, by the Death, Righteousness and Grace of our Lord Jesus Christ, to every one that is sincerely willing to accept of it by coming to Christ, or trusting in him; and it includes also the promised Aid of the Holy Spirit to those who seek it, to enable them to receive this Salvation, and to fit them for the final Possession of the promised Glory. It includes also the Revelation of the future Resurrection, the last Judgment and eternal Life. To this End did the Son of God come into the World, that whosoever believes on him should not perish, but have everlasting Life, John iii. 16.